For the grandeur accompanied with such a magnificent title as, “the entertainment capitol of the world”, Los Angeles’ hip-urban hotspot Melrose Ave seems to lack a pivotal ingredient behind such booming entertainment. Lit up billboards line the strip, and the famous Hollywood Improv Comedy club and Groundlings Improv Company sit on Melrose, in the heart of the action. And as for purely social settings, the select “happening” bars and lounges – specifically The Village Idiot, The Dark Room, and The Parlor (to name a few) – honestly earn their “happening” title, as by ten o’clock on a night like this Thursday, they are overflowing with attractive successful types, therefore undoubtedly embodying the vibes and atmosphere of the L.A. “scene”. However what this Melrose nightlife lacks is a form of entertainment that once defined Los Angeles: live music. Only some blocks away where Highland Ave. meets the 101 you can see major commercial acts at the outdoor concert cathedral the Hollywood Bowl for an overpriced ticket and a luminous light show. But seeing downright quality live music in the exclusive and intimate atmosphere of a club – like the way many clubs on the Sunset Strip iconicized rock’n’roll bands of the 1960’s, 1970’s and 1980’s – has now become a form of said “entertainment” that the city lacks. No longer can one easily stumble into a bar or club and appreciate free, original live music. Or so it seems. 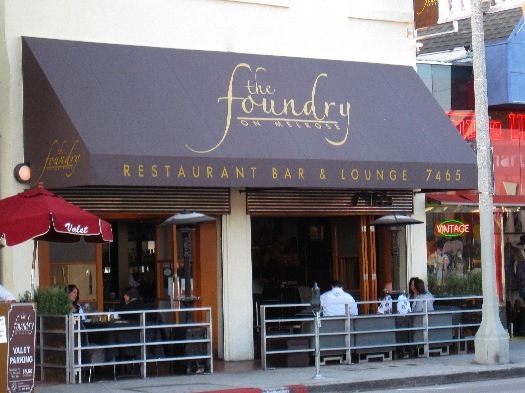 However on this windy and cold weeknight evening on the Melrose strip, even a native Angeleno would be somewhat surprised to find a more than half-decent live show taking place in The Foundry – a classy, dimly-lit restaurant/lounge that seems out of place to host anything other than their occasional, mellow instrumental jazz trio. The culprit behind tonight’s pleasant listening surprise? Phenomenal singer-songwriter George Stanford and his band. The multi-talented Stanford, originally hailing from Philly, has maintained a solid presence in LA for the past few years, and has quite an interesting, if not utterly inspiring tale behind his current career as a hard-working musician in the city of Angels – a creative role in the entertainment capitol thought of far less than the number of actors and screenwriters that are all around you, waiting your table, mixing your cocktail, or pouring your espresso. As I make my way to a vacant tall barstool at the Foundry’s short yet elegant bar, I notice that George and his band – drummer Matty Algers and bassist Spencer Wright – are setting up for the night’s show. Upon sitting down, I am almost instantly welcomed to the show by none other than Stanford’s wife Nikole, the leader and curator behind Stanford’s fan base attending tonight’s show. When not welcoming numerous friends that continue to walk through the door of the Foundry, she is nice enough to chat with me about her husband’s music and his journey through the surprisingly challenging Los Angeles music scene. When I ask Nikole about George’s sound as an independent musician from Philadelphia staying true to his roots while trying to tackle LA’s scene, she tells me that, “Philly is full of talent with a raw and organic sound…Lot’s of soul. It’s a big city but small town. George’s music has that. He’s a Philly musician who has lived in LA for five years. 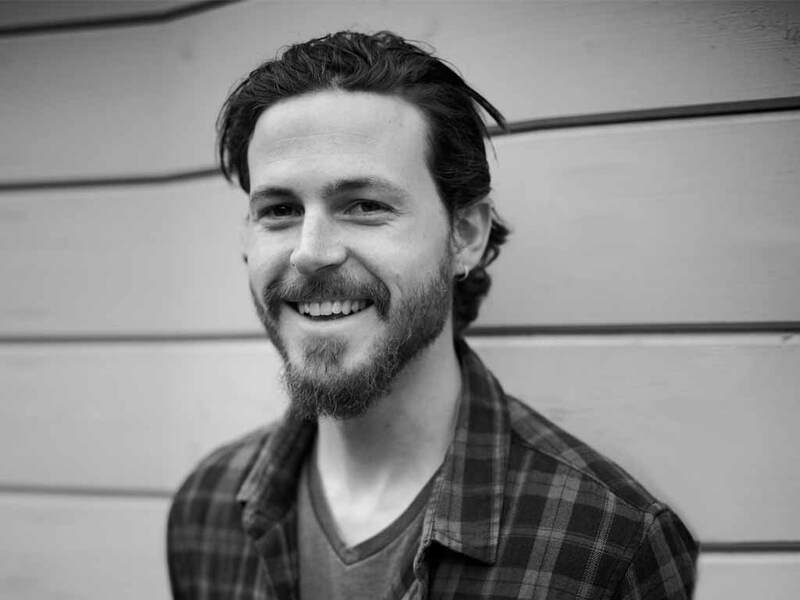 His music has that Philly sound, combined with a softer LA sound”. The combination is incredible, as in no time Stanford casually segways a five-minute, improvised, instrumental warm up jam into his soft, reflective opening tune, the title-track from his latest EP Roll Away. It’s all I need to see to realize that George creates his original sound through a combination of clean, spacey, and delay guitar effects and soft finger picking. His voice and guitar move together with beautiful, relaxed resonance that smoothly paves the way for his insightful lyrics. Only a few songs into the first set, and the Foundry’s bar and cozy, modern-décor lounge are bustling with listeners. As I scan the audience I am pleasantly surprised to realize that it is diversely made up of friends of the band, diners of the Foundry’s restaurant who want to get a better listen, and curious people off of the street who are warmly welcomed by the Foundry’s staff to come inside and listen to the free show. Next to me is Nikole, Stanford’s loving and supporting wife who sings along to every song, dancing in her barstool, enthusiastically offering me any possible information about George’s career inbetween songs. She then lights up as he begins to play Nikole, a song undoubtedly inspired by her, which chronicles his ambitious quest to Los Angeles in pursuit of musical success, only to realize that none of it is worth it to him without her by his side. Why are amazing acts of quality music like Stanford fighting for opportunity in a scene drenched with the weight of commercialized, wannabe famous types-turned-commodities who have monopolized popular music into something more concerned with absurd ticket sales and iTunes advertisements? There may be some aggressive claims and viewpoints in that question, but so be it. One thing that’s for sure is that for musicians not seeking fame, but rather to make a living doing what they love, George Stanford and his band are a perfect example of what is lacking in the limelight of 2012 Los Angeles. Not to denounce the likely abundance of similar acts in little hidden gem clubs throughout this sprawling metropolis. The quality music is here, but to hear it, you really have to search to find it. Before the show I was fortunate enough to interview George to ask him about this question circling my mind. At the bar, Stanford thankfully accepts a complimentary Vodka club soda from the exceptionally pleasant house bartender Ginger, just one member of an awesome Foundry staff that couldn’t be in greater support of the rare and under-appreciated music scene they host. He then turns to me with a genuine and appreciative smile, more than willing for me to conduct the interview. FB: So, on Melrose it’s kind of difficult to find live music, but you guys have actually been playing The Foundry about once a month for a while now? GS: Yeah, about once a month. It’s kind of been a loose residency for me, it’s kind of been like a last Tuesday or Thursday of every month. FB: It’s been a good experience thus far? Do you guys do well here? GS: It’s actually cool because as a local musician they pay you, and feed you here and take care of you, so, it’s a nice spot. FB: Good turn outs usually? GS: Yeah. I mean, depending on the night, but it’s been pretty good. FB: So you’re from Philly, right? FB: And you’ve been in LA how long? GS: About five years now. FB: Being a working musician in LA in 2012, what’s that like? How hard is it to book gigs? GS: It’s very challenging (really thinks about it). It’s challenging in Los Angeles to connect – especially as a songwriter – it’s difficult to connect original music with the money. So you kind of just have to do a lot of different stuff. Like I play with a lot of different people, I produce songs for people, I’ll engineer…kind of just piece it together. FB: And you make ends meet? FB: So Big Drop was your LP debut? FB: And therefore your “big drop”, and yet the label dropped you big. GS: Umm, it was a…corporate decision to drop me from the label the week my record came out. FB: Island Def Jam, right? FB: They signed you, you made the album, it released, and then they decided to drop you the week of? GS: It doesn’t make much sense to me. You know…companies make money decisions everyday, and…it just comes down to the bottom line: I didn’t fit into their scheme anymore. FB: I heard something about how you were trying to upload your video for My Own Worst Enemy, and then you figured out how to do it in six minutes. GS: (Laughs) Yeah. Well, yeah know, I learned a lot from that experience. I learned that it’s way more beneficial to have just yourself or one other person who is really passionate about what you do, rather than to have a whole company that doesn’t really care, you know? FB: Yeah. That’s too bad, honestly that’s kind of annoying to hear. GS: Well it was annoying to me at the time, but I learned a lot from it. And all’s well that ends well, and it hasn’t ended yet. Still working really hard. FB: And since then you put out Roll Away? GS: I put out Roll Away, a five song EP in 2010, and in March I’m releasing another EP, and then a full-length record later this year. So I’ve got a lot of new music in the works. FB: You record most of your own music, right? You recorded Roll Away yourself? GS: Yeah I recorded all of that at my old house on Las Palmas, in Hollywood here. And actually, the new record I’m putting out is called Las Palmas, kind of as a tribute to that spot. FB: And you recorded that one there as well? FB: And you record a lot of other musicians as well, right? FB: Do you do that just for money, or for friends? GS: I do all kinds of things, for passion, for dough, for whatever. FB: So you get a lot out of it, that’s cool. FB: So next for you is the two new records? GS: Yeah, there’s going to be a couple of releases in 2012, and I’m gonna be doing just a lot of new content this year. For a while I was doing an internet webcast weekly, which I’ll probably resume bi-weekly. And then putting out a lot of videos and stuff. FB: What parts of LA do you find most promising for a live music scene, as both a performer and as someone who appreciates live music? GS: The cool thing about playing here is that there’s a lot of other really talented and creative people around you. I’ve gotten involved in a lot of different projects just because someone heard me at a show here. Likewise, I’ve seen a lot of really cool music because somebody brought me to a show, so there’s a wealth of really talented people here. Its just about trying to plug in and really harness that. FB: In closing, what would you say is the most valuable piece of advice that you could offer an aspiring songwriter in L.A. in today’s scene, especially given your experience with the big record company? GS: That’s a good question, I would say it’s just to follow your own personal instinct about what is right for your music. Your instinct and your gut can really tell you a lot about if a situation is right or wrong regarding the creative direction of your music. It’s a series of decisions making and recording a song – from actually writing a song and all the decision that go in there, to sonically what you want to include and exclude. Trust your instinct along the way. Frankie Bourne is a singer-songwriter, screenwriter, filmmaker and journalist from San Francisco, CA. He lives in Los Angeles, CA.